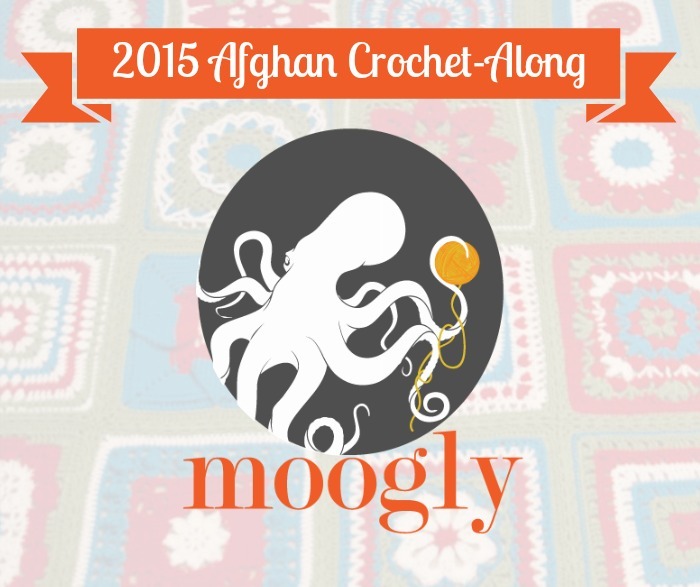 Announcing the 2015 Moogly Afghan Crochet-Along! 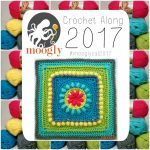 The Moogly Afghan Crochet-a-long for 2014 was a huge success, and I’ve loved seeing everyone’s projects all year! But the one question everyone has been asking for the past month…. what’s the plan for 2015? Well, I’ll tell you! I learned a lot in 2014, as it was my first time leading a CAL! And I set up a survey towards the ends, to see how you all felt about the experience, and what you hoped to see this next year. The responses were very enlightening! The vast majority would like to repeat last year’s CAL – with new blocks of course! So that’s what we’re going to do. In 2015, I’ll share a new 12″ block every 2 weeks – and you can CAL it with the rest of us, or if you don’t like it, select your own substitution. At the end, you can seam and edge them however you like. And you’ll have a 4′ x 6′ (or bigger!) afghan to show off! Now, one big problem we had in 2014 was patterns that were free… becoming paid. The other problem was blogs going offline, and taking their patterns into the ether! Well, I’ve come up with a solution for both that I’m very excited about! For the 2015 Moogly Afghan CAL, I’ve recruited 24 of my favorite fellow crochet bloggers. They’ll each design a 12″ block for the CAL – and it will always be free on their blogs! You’ll get to visit new and beloved designers and we won’t have to worry about any limited time offers. Some have already gotten started, and I know you’re going to love what they come up with! Once again we’ll be using worsted/aran weight yarn, and a US – I, 5.5mm hook. Beyond that, each designer has been given free rein to design something fun and exciting, in as many colors as they see fit! I plan on using Lion Brand Vanna’s Choice – though I’m still deciding on a color palette. Based on last year’s CAL, I’ll plan on purchasing 24-28 skeins, though I know with the Vanna’s Choice that dye lot won’t really be an issue. If you cannot purchase all your skeins at once, I’d recommend picking a non dye lot yarn, or one where the dye lots don’t seem to matter. However, if you’re using multiple colors and mixing up the order of the blocks while joining, the dye lot really won’t matter at all – all things to consider! Also exciting – there’s a new Ravelry group for the 2015 CAL! CLICK HERE to check it out and join up! It’s a great place to show off your finished blocks, and get help with tricky ones too. The moderators are volunteers, and work very hard to keep things running smoothly, so please give them some thanks – they’re a HUGE help! If you’re still finishing up the 2014 CAL, don’t worry – my posts aren’t going anywhere, and I’ll keep the link in the drop down menu at the top of the page so you can find them throughout 2015. However, I do recommend printing or downloading the rest of the patterns asap – many will become paid or may disappear, and I cannot provide them to you! If you need help with one, check out the appropriate thread in the Ravelry 2014 CAL group! So, I hope you’ll join us in 2015! I can’t wait to see what this year has in store – after all, the blocks themselves will be a surprise to me too, this time around! The first block for the 2015 CAL will be shared on January 8th! 😀 Thank you, I hope you join in!! Where can we collect patterns for the blocks from the 2014 cal? Yes Imeissed this opportunity also and am looking into the next one? I wanted to use caron united yarn for mine but when i searched it on michaels it didnt tell me the skein, how many balls of caron united do i need to buy? I am interested in joining in the lessons. I can not wait to participate in the 2015 one as well! I am thrilled it will be the same as the 2014 CAL. thank you for hosting it again, it is just one more thing to look forward to in 2015! I’m excited, my first CAL!!! I’m about half way through the 2014 CAL! But I fully intend to start 2015 on time and stay current. Thanks so much for doing this! Now the hard part will be to pick colors. Definitely the hardest part for me too! How many different colors of yarns should I get? I want to be prepared. And then how many of each color? How many colors do you suggest we start with? However many you like! 🙂 I did 4 last year, I’m still deciding for this year! I’m so excited for this CAL! I didn’t do it this year. Saw it too late and no time to catch up. Question though, how many different colors do you recommend for the project? Can’t wait to see what your friends come up with for 2015!! Would love to join the 2015 CAL. What fun! I signed up for the 2015 CAL!! I’m excited and looking forward to learning great things!! Thanks for adding me!! I came to this website late so didn’t get in on the 2014 CAL. I am looking forward to trying to keep up with 2015. I wanted to make a afghan for a friend and will be using a lot of the squares from the 2014. Who knows I may add some of the 2015 to it while making my own afghan from the CAL. I look forward to increasing my skill set this coming year. This will be my first CAL, so excited the first block is being released on my birthday! Can’t wait! I signed in on the Ravelry group to do this. I need an afghan for a gift for beginnig of 2016, so I am going to join and make this for the bride. Hmmm colors? I cannot wait to get going on this. Off to the Vanna Section……….. I am going to try to get in on the fun! Excited!! I can hardly wait…… hmmmmmm is it 2015 YET ! how big will this be? over 24 skeins seems like a lot?? It’s 4′ x 6′ plus – the border and joining method each person chooses adds a fair bit. 🙂 And this year’s might use less! It’s hard to say with any certainty. I am excited this will be my first time joining in on the fun. So I will need someone to lead me through. So how does this work? do you get one square a month to work on or is it weekly? just curious. I can’t wait. I jumped in late this year. I picked and chose the squares I wanted, and found others in some other places. I made 24 squares in Ohio State colors and I think It came out well. I’m working on the borders. 😀 Glad you did, Rose! i’ve just recently gotten back into crocheting and have saved the blocks from your 2014 CAL. I am looking forward to participating in the 2015 CAL to help in adding to my crocheting skills. Since I have been out of crocheting for about 30 years, although I have still been knitting, the smaller blocks should be easier to re-learn this awesome craft than a larger project. I can’t wait to join in the fun, I’ve never done a CAL so I’m looking forward to it. So am I to understand, we get two weeks to create one square? I’ll share a new square every two weeks, but of course you work at your own pace. 🙂 Usually a square takes an evening, maybe two, so it’s relatively easy to catch up if you do fall behind! I had never made a granny square before this year and have really loved learning how. I’m super excited about next years CAL. Now I need to finish this year’s. I only have the last square to do and putting it together. I stopped to make Christmas gifts. I can’t wait for the new CAL. I loved doing to 2014 one. Im Really excited about how the squares are being designed for this. I can’t wait to see what you and your crochet blogger friends have in store for us! I’ll be following along and see how I go. I’ll probably end up behind and then doing lots all at once but that’s just how the creative moments go. Oh I love that Amanda! What a great idea! 😀 Thank you Lori, I’m so glad you liked it!! I found Moogly just about a week ago and have been enjoying it since. I am excited about make afagan this coming year. Oh perfect timing! 😀 Yay! thanks, Tamara. You are awesome!! I will do only one afghan this time though. You have so many other patterns that I want to try, I love your site. I’m gonna be doing the 2015 CAL! I didn’t get to the 2014 one in time, but I’ve downloaded the free blocks so I have them! I enjoyed the 2014 CAL, though I only finished up to Block #17 because I had to start on my Christmas present making. I do plan to finish in 2015 and try to do the 2015 CAL as well. Thanks…very excited to see brand new designs from what I am sure will be some of my favorite designers! I didnt have the chance to do the 2014 CAL but I definitely want to do the 2015! Thank you Moogly for your inspiration, needed all the way here in Australia. i taught myself to crochet when I was 16 with 1 hook 1 skein of red heart yarn and a small bookletI picked up at a dime store ( something that no longer exists) . Way back when in the ’60s.that was over 50 years ago, and I’m still hooking away ! I can’t begin to imagine how many pair of booties I have crocheted or afghans, or scarves or baby blankets or Shall I go on? The list is endless! I live in Springfield, Illinois. I do not have any children, my husband died in 2005, but I have a wonderful little miniature dachshund, named Dolly, whom I dote on. I live at the Mary Bryant Home for the Blind and Visually Handicapped, because I am losing my sight to macular degeneration and diabetic retinopathy, but as long as I can see a little and with visual aids, I am going to hook on! My 11 year old daughter and I were going to do something similar, but this sounds like fun, we are beginners, do you think these blocks be to hard for us,? Can’t wait for the new CAL to begin. I have promised myself to finish this new GOAL next year. I would really like to try this in 2015. I have never participated in one before. This will be my stash buster project for 2015. I made two pillows with squares from the 2014 CAL and they turned out so lovely. Can’t wait to get started in 2015! Thrilled you are doing this again in 2015! I found this site late 2014 and had hoped this would happen-can’t wait to join in the fun next year. I’m looking forward to the 2015 CAL! I’ve only done about half of the 2014 blocks; I started late, and then stopped to do some gifts. But that’s OK; I’ll make sure to save/print all the blocks in time, and the finished afghan will be for myself anyway. I chose to do the 2014 blocks in all one color so I could concentrate on learning the stitches. I think I’ll try to use 3 or 4 colors for 2015 so I can learn how to do good color changes. Should be fun! I would love to join the 2015 CAL CHALLENGE. I CAN’T FIND WHERE YOU SIGN UP.. I AM SURE I MUST BE OVERLOOKING IT.. PLEASE HELP?? Hi Kelley! There’s no sign up – it’s join in at will! 🙂 You can join the Ravelry group if you like, it’s linked in the post, but you don’t have to sign up anywhere or anything like that. Can’t wait to get started, I missed being part of 2014! Wishing everyone a Merry Christmas and a Happy Nee Year! Thank you Veronica! Merry Christmas and Happy New Year to you too! 😀 Yay, so glad you found us April! Welcome welcome! I can’t find on the website where you sign up for the 2015 CAL.. is there a link I was missing? I get your blog I was not a part of the 2014 CAL – Am thinking about joining in this one!!! Looking forward to joining the 2015 group. I’m ready to go. Looks like fun. I just joined and am excited. So if we are signed up for you email.do we.automatically get each square? I crochet left handed so hopefully it will all.work.out. The squares are all free! 😀 I’ll write about each one here on the blog, and include a link to that post in the newsletter as well, so you should be covered! 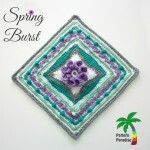 So glad you decided to repeat the CAL of bi-monthly 12″ squares to make an afghan!!! I did it all in Red, white and Blue last year – what to chose, what to chose….maybe pinks? Maybe black and white with grey? hummm…gotta see what I have on hand…LOL. Choices choices. 😀 Thank you Dianna! I’m excited to get started! I’ve been really crazy busy in 2014 but wanting to join the CAL. I’ve got the 2015 CAL on my New Year’s Resolutions list! Now, as some of the others have said, what colors would be best? Thanks for continuing with your blog, newsletters and the CAL. Happy New Year! I’m excited to join in this year, I didn’t discover Moogly until late 2014 so I missed out, but I’ll make the most of this one. And hopefully find new friends too! When does the 2015 cal start please? I’m so excited to participate in the new CAL!!! I have never participated in a CAL before, but am excited to join in on this adventure. I love the patterns I have found here. Thank you for sharing. OHHHH when does the first pattern come out! I’m itching to get started since I missed last years!! I joined your blog around October so wasn’t in on the 2014 CAL. I’m so looking forward to the 2015 one and thank all concerned in making it happen. I really hope to participate this year! I like using Redheart, but will keep in mind dye lots and stuff. I really want to start something like this and keep up with it. I just hope I can get caught up with the gift before all this starts! I’m excited about it and am looking forward to learning something new! Oh…and Merry Christmas to everyone! This sounds like so much fun. I have never done anything like this and can’t wait to start. So happy that I found your site! what is the level you need to be able to crochet at to be a part of this? I’d say adventurous beginner, willing to learn something new! 😀 I always learn something during these! Merry Christmas. I didn’t do last year’s CAL and am so excited to be a part of this one. Didnt do the CAL 2014. Very much interested in the 2015. Where do I start? The first square will be shared on January 8th! 🙂 For now, you can choose your yarn colors! i didn’t participate in 2014 but would like to try this in 2015! What. Level of. Experience needed? I’m so excited to get started on this CAL. It will be my first, and I’m making it part of my New Years’ Resolutions to complete this project since I have a tendency to pile up UFOs. I know you say color choice is a personal thing, but do you have a recommendation for a newbie as to how to go about choosing colors? Like how many is a good, underwhelming number to go with? I’m just asking because I tend to overcomplicate things and then give up because I’m overwhelmed. When you say you use 4 colors, it that three for the squares and one to join and border? Is that a good guideline to follow to not get overwhelmed? Thanks for your time in answering and in coordinating all this. I purchase my yarn today! I’m ready to go. My best friend is also doing this CAL with me. This will be our second Afghan CAL. I’m so excited!! I found out about the 2014 CAL in the fall, but I still plan to make it at the same time as I am completing the 2015 CAL. Will plan to alternate squares so I will complete one a week. Greatly appreciate that you are committed to the patterns remaining free; that caused me a problem with 2014’s as some are now for purchase. Eager to finalize my color choices and get started! I didn’t participate this year because I was in the middle of crocheting my daughter’s wedding gift. My yarn came today, and I’m ready for the 2015 CAL! Do we follow along here? Or on the Ravelry website? I would love to do the 2015 cal. This will be my first time. I followed along with the 2014 CAL but didn’t participate because I was crocheting my daughter’s wedding gift. This will be my first CAL, and I can’t wait for the first pattern! My yarn came yesterday, so I’m ready to go! What happens when you are not an experienced crocheter and don’t know all the patterns and stitches? My mom, little sister and I will be participating in this CAL, it is a first for all of us. We had a Girls Day Out today to pick our colors and purchase our yarn. I found your blog a couple of weeks ago…perfect timing! We are all Super Excited!! 😀 Awesome, thank you Teri! I am looking forward to this. I hope that it’s easy to find the patterns …. When I found this site in December I had difficulty seeing and finding patterns. I am not computer savy. Thank you for the challenge Tamara. Thank you for all hard work. I’m from Iowa as well. Crochet is not only fun,it has helped heal my spirit and create a stronger relationship with my daughter who I taught to crochet as well. I have done several projects since teaching myself crochet but I’ve never done afghans. I have given my great nieces and nephew crochets dolls and bears. I’d like to give them something they can keep and pass on. 🙂 That sounds so lovely Jodi! Happy New Year! Looking forward to the CAL, never done anything like this before, only started to learn in August 2014 with yarn bought as a birthday present. I’m in the uk, and have just treated myself to about 15 100g balls of dk, my favourite yarn at the moment, in a few different colours. Do you know if that should se me through the project, or will I need a top up? Anxious to get started….my 1st CAL !! No need to sign up, just join in as you like! 😀 Thank you Wendy! Any idea as to the max number of colors we would be looking at? The sky is the limit! If you wanted to be sure to get every color in every block, then I’d guess 12 would be a safe maximum, but otherwise it’s however many you like! I am excited to start!!! I just recently started back crocheting and have a good time looking at all that the Internet has to offer! I, too, am looking forward to meeting new friends! One looses contact with others when retired! Sounds fun! I hope I can keep up! ? Thanks for doing this! I need to pick some colors! How much yarn would you reccomend for the color you will be joining with? 300 yds or so, depending on your joining method. I did not do the CAL last year but I am going to participate this year and am very excited! Now to figure out the colorway? How many colors did you use last year? Last year I used 4, this year I’m using 6 – it’s always fun to see all the different variations! I’m in, need to shop for yarn, thinking about colors now. I’m excited! For Christmas this year my sister gave me a box full of 21 skeins of yarn. Red heart soft. I have 7 different colors this might be just perfect to use them on this project. Yay! I’m so excited! I was wondering if you know of any good resources online for discounted yarn? Please let me know! Craftsy can have good deals, and I’ve heard that Vanna’s Choice is 20% off when you order directly from Lion Brand – no idea how long that deal will last! Reading these comments has enticed me to join in with CAL 2015. I have been crocheting 18 months and love it, am excited to be part of this. Have ordered some wool, and hope it will be here in time to start. This is fun and FYI Vanna’s yarn is 20% off. Not sure if you get a commision for any sales from said brand but I thought I would let everyone know. This is through January. I am excited to join you in this project! Thank you! I am interested in participating but I am a little hesitant as I am definitely still a beginner at crocheting. How difficult would you say the blocks are/can be? I’m sure they’ll be interesting, but since we’re making them all together is should be a great way to improve everyone’s crochet skills! Hi Tamarac. Benn following your blog via Pinterest and I love your patterns. I’d love to join in with the CAL but I’m in the UK and don’t know how much is in a skein of wool. How many 100g balls of double knit do you think I’d need? I’m not sure how to translate it to grams – so much depends on what fibers! Basically around 4000 yds, give or take. How do I sign up for the crochet-a-long? Bought my yarn and am ready to start! Really looking forward to this. I bought Vanna’s Choice in Fern, Magenta, Dusty Purple, and Purple. It was 50% off at Michael’s. First CAL ever! Very excited for the first square! I want to follow this and be informed when the event starts. 🙂 Will I get an email each time the new pattern is posted? this all new to me and I am excited to complete an afghan this year! This sounds like such a lot of fun and probably the only way I could find the commitment to complete an afghan! Ha. I know you said you haven’t picked your colour palette yet but can you tell us how many colours would be used? Thanks! Can’t wait to try this. Only started crochet a couple of months ago but super addicted. Going for very colorful and lots of different shades from Vanna’s Choice. Being Brazilian I love bright colors and it will help brighten up our home in Scotland. I’m very excited to do this! I’m hoping it won’t be too hard. Is there a place to join or do you just look for the new square every two weeks? Just watch for the new squares! 😀 I’ll post about it here and on social media and in the weekly newsletter. Thanks Carrie! so, I wasn’t i the 2014 either but going to do the 2015. How do we find the “new” squares?? will they come to our email or on fb or on Moogly site?? I am SO late to this party, but I just wanted to pop in and say: I am so excited for this CAL! I missed the 2014 one, although I gazed admiringly at the beautiful afghans posted here and on Ravelry. Can’t wait to be part of this group in 2015! i would love to join your CAL. I would love to join the 2015 CA L.
I can’t wait to start!!!! I am so excited to start this CAL. I have never done one before and am looking forward to being in a group on Ravelry too! I have my yarn colors ready, my daughter picked them. Thanks for leading a group like thi s, what a great way to connect people from all over. 😀 Welcome Rocky, I’m so glad you’re on board! I am so excited for this CAL. I was having difficulty choosing colors for this CAL. While discussing this with my husband and deciding who I was making this for I have decided to crochet my Afghan in Avengers colors. Each square will be the colors of one of Marvels superheros. I love mixing two worlds together that don’t typically intertwine and giving it this whole new concept or idea!! I am excited to do this and so is my son!!! He can’t wait for me to make him his own blanket little does he know it will take me a year to make it. I’m so nervous! I’ve never done a CAL, I want to do the designers squares justice, but I’m not an experienced crocheter. Advanced Beginner I think! That was one thing I needed to know, what is the difficulty level for the squares? Will there be any help for newbies? I know one CAL in 2014 that had someone who did tutorials for each block. Now, how to join? Do we just start working on the square? I ask a LOT of questions, don’t I? How do or where do I sign up to join the CAL? I would love to participate. I didn’t get to do the CAL 2014 because I just discovered your page, Where can I see the patterns for this CAL I would like to make my blanket . I sterted the 2014 project but couldn’t go on… my OCD didn’t let me live with its “randomness”… not knowing how the following square looked like, and how the whole blanket was going to result!!! Now I am really excited with the new one!! I know it will be great! I’m so glad you’re giving it another try Romi! 😀 It’s an adventure, as not even I have seen all the squares yet this year! I am so flipping excited to do this! I’ve been a beginner/amateur crocheter for YEARS. I haven’t piked up a hook in a few years and about two weeks ago, I collaborated with my sister on a simple granny square blanket to make her. I planned on doing 2 squares a day and have been keeping up with it. 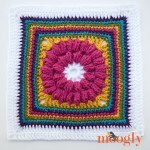 I happened to see your finished Square 2 on my FB page and wondered what CAL was, so I clicked to learn more. thought I couldn’t possibly do a granny square blanket AND this too! I found some friends in my tiny private crochet group to do it with me and about four of us are doing it together! I have kept up with my sister’s blanket and finished both squares. I am so thankful you are doing this and I have already learned SO much from these two squares. THANK YOU for renewing my passion for crochet! I have just come across your site and want to participate in the afghan crochet along. Am I too late to participate? If not what do I need to do to sign up ? I would like to do this crochet along. Where do I get all the instructions. Hi, I’m late to start but excited. Wondering how many skeins of each color you purchased. I plan to use Vanna’s Choice too, can’t get enough of that yarn..love it! I’m a bit late to the party and have some catching up to do! Can’t wait to get started! 😀 Welcome Ali! Lots of time to catch up! Kind of jumping in late here…looks like fun! Is there a link to what supplies you will need for the entirety of this project? Also, alternate yarn brands that would be appropriate? I just found this CAL for 2015 & ordered my yarn, which will take 2 weeks to arrive. I’ve been trying to find video tutorials for each square. I keep going from one link to another to no avail. Do you have video tutorials? Hi Bonnie! None of the patterns for this CAL have video tutorials except the first one so far. Making video tutorials would be up to the individual designers. I’ve decided to give this a try. I am self-taught, well me and U tube. 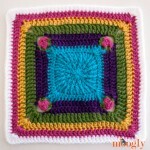 Are there picture tutorials for any of the squares on Ravelry. I’d love to learn more but I’m truly stumped in some places. Thanks. Some, but not all – I’m afraid I don’t have a separate list of those that do.